BOBCAT Skid Steer Tires: Bobcat Skid Steers have been around since 1958 and still to this day continue to be the most popular skid steer in the construction industry. Bobcat has pioneered things such as the Bob-Tach quick change mounting system which has become industry standard for quick change attachment systems. No matter how much the industry evolves the one thing that won’t change is the need for tires. Monster Tires offers incredibly affordable Bobcat Skid Steer Tire sets for the best prices and quickest time to get your Bobcat back to work. Are you looking for high quality construction tires for your Bobcat Skid Steer? At Monster Tires, we have the best tires at the best prices you’ll find. We are your one-stop resource for skid steer tires for your Bobcat 843 – 863 Skid Steer, 742 – 773 Skid Steer, 642 – 642B Skid Steer, and 542 – 553 Skid Steer. Whether you need a Set of Front Tires for Bobcat Skid Steer, a Set of Rear Tires for Bobcat Skid Steer, or a Set of 4 Tires for Bobcat Skid Steer, Monster Tires has what you are looking for. Dependability and Reliability for all Bobcat Skid Steer Tires with Monster Tires. The safety and effectiveness of your construction project depends on the quality of the tires on your Bobcat Skid Steer. With good tires, you can operate in difficult conditions without losing traction, ensure that your workers are safer, and even operate the equipment in greater comfort. 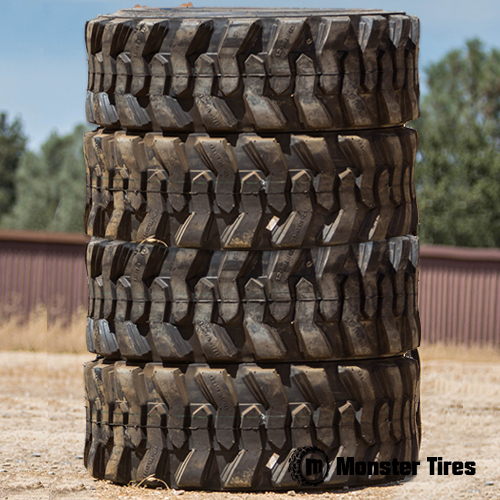 Trust in Monster Tires for your next set of Bobcat Skid Steer Tires. We have the Heavy Equipment Tires to get your piece of equipment rolling again!